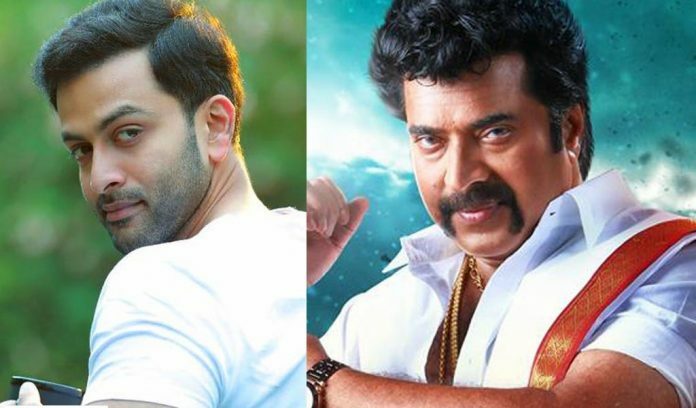 Home News Malayalam Prithviraj joins Madhuraraja for a cameo ? The latest buz from the sets of Madhuraraja, which seems to be sequel or rather spinoff from 2010 highest grosser and blockbuster movie ‘Pokkiriraja’ directed by Malayalam’s most sought out mass entertainer maker Vyshak, is that young superstar Prithviraj has joined the sets to reprise the role of Surya from Pokkiriraja. Prithvi played Surya who was brother to Raja played by Megastar Mammootty. It is rumoured that Mammootty, Prithvi and Tamil actor Jai would be seen together in a fight sequence in Madhuraja. Madhuraraja boasts of a heavy star cast and is planned to hit theaters for either Vishu or Eid next year. The big budget movie is bankrolled by Nelson Ipe.